This week Marlie had less tantrums and NO hitting! I found the solution to her hissy fits is not to acknowledge them. I simply say, "let me know when you are finished and ready to talk" and I walk away. With the hitting, I have been emphasizing "nice touch" and explaining that hitting makes us sad. It seems to be working. Hallelujah! We started off by attending the Mardi Gras parade around the corner. This was a treat since Damon's side of the family is from Mobile, AL (the real birthplace of Mardi Gras, according to my darling historian). 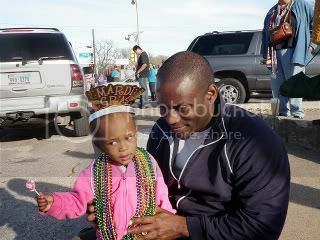 I promise she didn't do anything racy to get all those beads! Marlie demonstrated her gymnastic abilities while we watched gymnasts compete on TV. She was lifting her leg, twirling and doing all the bends she saw them do. She is learning to dress herself. She can put on one pant leg and put her arm through one sleeve and then she needs help doing the rest, but I think this is awesome. Socks still stump her though. You already know how she loves saying bye-bye to everyone and everything. Now she has added "see you later," sounding it as "see lay-ler." She learned to say aloe, which is not surprising since I'm always lathering her up with the stuff. I'm working on getting her to say "aloe you" because it sounds very similar to "I love you"....cheating? maybe! Newest bad habits: licking! She licks her food, licks your face, licks the table top, licks her toys...it's gross. She is also drawing on the furniture with her crayons. They have been confiscated for the time being. Newest obsession: Dr. Seuss books. She likes the rhymes and the repetition. I am ready to poke my eyeballs out to have an excuse not to read Hand, Hand, Fingers, Thumb anymore. Yay on the tantrum cut down. That's awesome. You know I ignore jas's tantrums too and that usually works. And you know I love seeing pivs of little Marlie. So cute! Dr. Seuss books are GREAT for the little ones. A reading teacher told me that she recommends reading them to kids as soon as they show interest in the rhymes and pictures. The ignoring tantrum technique is a great strategy. I even use it on my older kids who still decide to have meltdowns here and there. Love the cute picture too! Oh the licking! Great way to work with the tantrums. That's what I had to do with my son. My daughters never thrwe tantrums. Thank God! Miss V likes to lick also, it is so gross! I was actually born in Montgomery, AL. My mom grew up in AL and was in AL for my birth. Hubby was born in Huntsville, but we met in CA. Abby has just recently, at 3 years old starting licking. It's so gross. Go in for a kiss, get SOAKED. We had to take the crayons away too, Abby just recently got them back and I still catch her coloring on things she shouldn't sometimes. I'm glad your solution for the hitting is working! Thanks for the tips on dealing with tantrums. I have a feeling that phase is getting ready to begin. And 'Aloe you'. Cheating smeating. If she says it and it sounds like 'I Love You' I will be truly envious my friend! That's the PERFECT thing to do when a tot is having a tantrum. I've done it with my own kid and with several other kids and it works really well. No point in trying to calm a tot down mid tantrum -- it requires too much energy and doesn't work. LOL. How cute is it that she is trying to dress herself? And "Hands Hands Fingers Thumb" is one of our FAVORITE books over here. Great minds think alike!